This photograph shows inmates George R. Estell, prisoner number 8252 and Joe Wade, prisoner number 7617. 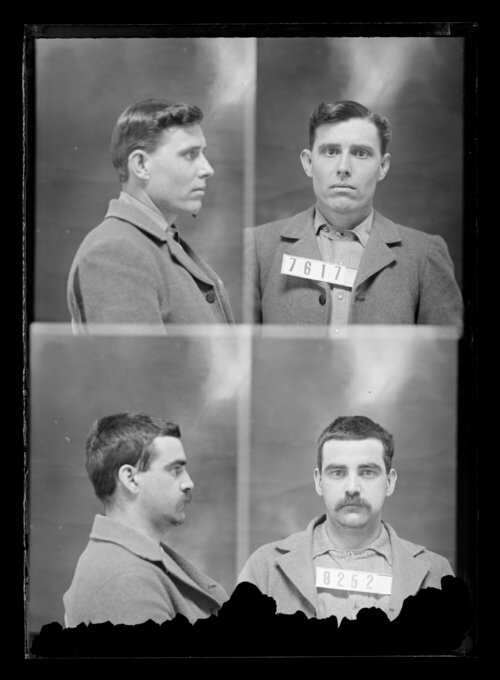 George R. Estell, also known with the surname spelling Estelle, was received at the Kansas State Penitentiary on October 2, 1897 from Sedgwick County, Kansas for burglary. Joe Wade was received at the penitentiary on December 6, 1895 from Wyandotte County, Kansas for robbery. He served two terms in the penitentiary. See also Unit ID 311231.